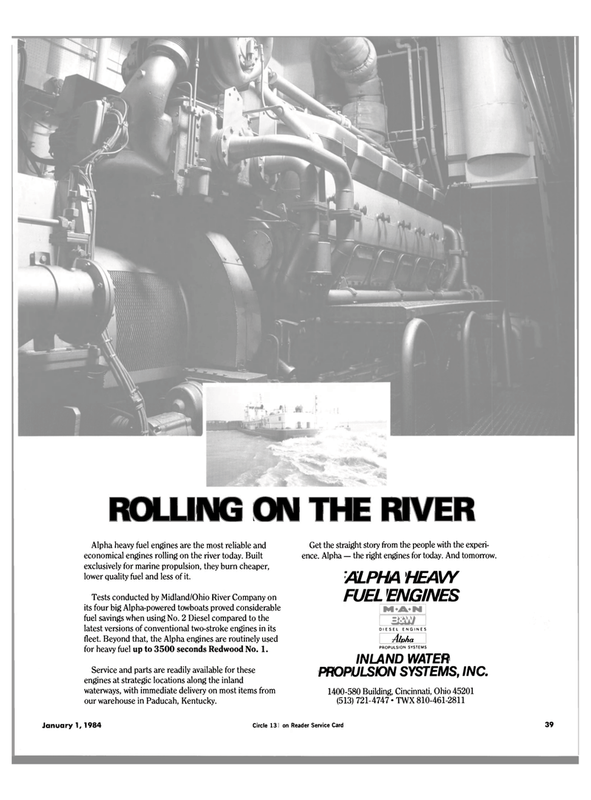 Alpha heavy fuel engines are the most reliable and economical engines rolling on the river today. Built exclusively for marine propulsion, they burn cheaper, lower quality fuel and less of it. Tests conducted by Midland/Ohio River Company on its four big Alpha-powered towboats proved considerable fuel savings when using No. 2 Diesel compared to the latest versions of conventional two-stroke engines in its fleet. Beyond that, the Alpha engines are routinely used for heavy fuel up to 3500 seconds Redwood No. 1. Service and parts are readily available for these engines at strategic locations along the inland waterways, with immediate delivery on most items from our warehouse in Paducah, Kentucky. Get the straight story from the people with the experi- ence. Alpha — the right engines for today. And tomorrow. Ohio Kentucky WATER PROPULSION SYSTEMS INC.